We have redesigned our Events 2019 page hoping that the new version will make it easier for you to plan the activities for you next stay in Berlin. It includes more events, which are presented in topical groups according to the 12 months of the year. We also propose activities for each month. Besides, there are interesting links for those who want to dig further in the passionate past and present of the city. The page is valid during the whole year and will be regularly updated and completed with dates and current recommendations. So it may be worthwhile to have a look at our pages from time to time! another event in the cultural calendar. A trip to Berlin is always worthwhile. But during wintertime it is especially attractive to those who appreciate the city’s cultural offer. There are theatres, operas and cabarets, countless museums, art galleries and other exhibition sites awaiting you. Thanks to this broad offer everybody finds something to her or his liking. As we want to help you plan your stay in Berlin, on our pages you find a choice of museums and cultural venues as well as some recommended events on the cultural agenda. Twice a year the Berlin museums open at a time they normally close. From 6 pm until 2 am 110 museums and other historical institutions receive their visitors with a varied programme – in addition to the “normal” exhibitions – including workshops, lectures, readings, concerts, dance shows and guided tours, many even offer food and drink. A unique occasion to get to know new places or to experience the famous ones in a different atmosphere. The museums, which lie scattered throughout the city, are connected by a special bus shuttle service. Did you know that Berlin is the film capital of Germany? The German version of Hollywood is called Babelsberg and lies at the gates of Berlin. In these studios some of the classics of early cinema were produced, such as “Metropolis” by Fritz Lang and “The Blue Angel” starring Marlene Dietrich. At Potsdamer Platz, the German Film Academy is located, as well as the Film and Television museum and the German Film Archive. Every year in February real film stars meet nearby, on occasion of the International Film Festival “, as the Musical Theatre is converted in “Berlinale Palace” where the premieres of the films participating in the competition are held. Besides, you mustn’t forget that many producers and directors like to work here: Around 150 films per year are filmed here, among them big productions like “Around the world in 80 days” by Frank Coraci starring Jackie Chan or “The Bourne Supremacy” by Paul Greengrass starring Matt Damon who, by the way, is said to have an apartment here. The Berlinale Festival enjoys an international reputation and is considered one of the most influential film festivals of the world. In any case, it is the one with most visitors, as in Berlin the festival does not only take place on the red carpet and at media events, but inside the projection rooms, thanks to an enthusiastic audience. The festival comprises different sections like the “Berlinale Talent Campus” intended to discover and promote promising talents of the trade and the popular Children’s Film Festival. The official website provides exhaustive information about the programme and ticket sales points. As you may know the saying goes “If March comes in like a lion, it goes out like a lamb” – or the other way round! So, everything is possible and although the month cannot be trusted, it is worth trying outdoors activities again: Maybe a ramble through the streets of Berlin or a trip to the outskirts. You may prefer to stay inside, benefit from the rich cultural offer and or make plans for sunnier seasons, but remember that a visit to ITB – the world’s biggest touristic fair – is no guarantee for a splendid summer! No other fair of this trade can boast of attracting each year as may visitors as this platform with 11,000 exhibitors from 180 countries? On 150,000 sq. m. the whole planet meets, with all countries trying to outrival their stand neighbours with even more colourful pictures, more attractive offers and exciting promises. If you want to plan you next holiday or just dream of beautiful destination at the other side of the world – here you get stuff to feed your imagination. 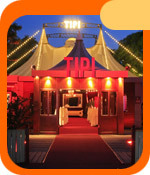 From 7 to 11 March are days reserved for trade visitors (tickets for these days are only available online). Berlin is a real metropolis, a city grown over centuries to reach a size which is 8 times the one of Paris (within city limits). But still, you have to consider the big green spaces in the city, two big zoos and a lot of small and big public gardens. And when leaving the city behind, you will discover vast natural spaces, some of great beauty, in its immediate neighbourhood. The Berlin Brandenburg region is an ideal option for those who wish to combine cultural activities with sports and impressions of natural landscapes. Elsewhere it may be the swallows that announce spring, but in Berlin the fact that boats and barges reappear on the rivers of Spree, Havel and Dahme is an unmistakable sign that warm weather has definitely arrived. With sunshine a boat trip along Berlin’s rivers and canals is a pleasant pastime during which you comfortably discover the city from a new perspective. The classical short trip of only one hour takes you from the Museums Island downstream to the level of Bellevue palace and back again. On the more extensive cruises starting from Berlin (e.g. Tegel or Treptow) the boat will cross various lakes. Thanks to immigration a new European tradition has emerged in the past decades, Berlin Karneval der Kulturen standing in a row with the London Notting Hill Carnival and Rotterdamer Zomercarnaval. In fact, many cultures from countries all over the world contribute to the most popular multicultural event in Germany that turns the streets of Kreuzberg into a stage where a new, sometimes wild mixture of very different traditions is presented. Not only the classical cultural associations take part in the show, but also groups with mixed ethnic background – all of them have been rehearsing for months and are eager to dance and party. Moreover , one of the over 100 groups is be awarded for the best performance. In 2009, 1.3 million of spectators came, not only to see the carnival, lining the streets during the parade (that moves forward very slowly), but to be a part of it. At the big party on the streets around the America Memorial Library lasts four days, Caipirinha is the most popular drink. Taste some of the exotic snacks on offer at many stands or enjoy great concerts on four stages. A great atmosphere not to be missed! It all started when the electors of Brandenburg chose Berlin as their residence town. In 1701 the Elector chose to make himself king, and in 1871 King William II and Otto von Bismarck – the Iron Chancellor of Prussia – took the final steps towards founding an all-German empire, thus the Prussian king becoming German emperor. These facts explain why German history is closely linked to the history of Prussia. The reign of Frederick the Great, who was a friend of Voltaire and lover of arts, is generally considered one of the more glorious chapters of that history. During a stay in Berlin and Potsdam (45 min by train from Berlin) you have the opportunity to learn a lot more about these sovereigns, about their palaces and portraits, their likes and dislikes as well as their artistic and historical legacy. .
Christopher Street Day forms a part of the long tradition of demonstrations since homosexuals started to fight for equal rights and a tolerant society. The Berlin CSD is not the only one in Germany, but the biggest event of this kind throughout whole Europe, thanks to an important gay community and the open spirit of Berlin (500,000 spectators). During the two weeks prior to CSD, there is a series of gay events, the Week of Pride, which includes another big party taking place from 20 to 21 July 2019 on the streets of Schöneberg (Nollendorfplatz)., a quarter marked by a colourful gay infrastructure. Beach life in Berlin? Yes, you are right. Berlin has lots of water and some wonderful sandy beaches! Besides, we have just rediscovered the river that crosses Berlin. Although bathing is not allowed there, the riverside is the ideal place for a deckchair and a cool drink in the sun. Lately, beach bars have been shooting from the ground like mushrooms – perfect places for a chilling out on a summer night. But the real beaches where you can hop into the water of beautiful lakes like Müggelsee and Wannsee lie on the outskirts of Berlin. Since the days of the 19 th century Berliners have sought rest and recreation by the lakesides and in their beautiful surroundings. In times when many did not even have a bath at home, people even referred to the lakes as the “big bath tub”. Today, the water quality is very good, because the glaciers of the ice age left lots of sand in the region, which acts like a filter. A festival of classical music on beautiful Gendarmenmarkt square. Between the mid-June and mid-July various big parades take place on the Berlin streets. The most famous one is the parade on Christopher Street Day: It is a gathering of the Berlin and international gay community, a celebration of different life style and demand for tolerance. In a city where the mayor is known to be gay this is a family-compatible event; around 1 million people come to watch every year. But the real titbit is Berlin’s colourful carnival that takes place in the quarter of Kreuzberg, not far from the city centre, each year on Pentecost weekend. Apart from a big party it is a unique occasion to plunge deep into the multicultural cocktail which is the essence of Berlin. Berlin also is an important centre in terms of sports. Fans and amateur athletes will find a varied programme throughout the whole year. Among the top events are the Six Days Race in January, the international women’s tennis championship German Open in May, the international athletic festival ISTAF in September. Last but not least the legendary Berlin marathon that keeps attracting ten thousands of enthusiastic athletes and spectators every year. The traditional marathon across the streets of Berlin was attended by over 40,000 athletes from 100 countries. Inline-Skaters will inaugurate the route one day before the race. The biggest fair of consumer electronics and entertainment worldwide. Be one of the 250,000 visitors who wanted to have a look at how their future high definition TV set or multi-media system will look like. At the stands of 1,200 exhibitors you will encounter an incredibly wide variety of electronic devices on top of technology. 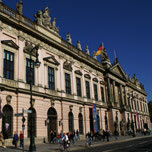 Berlin enjoys a great reputation for its cultural landscape, in which the museums are one of the main attractions. There are 150 of them, some boasting with famous collections, some with hidden and curious treasures. The entire history is represented, with exhibits ranging from the bust of Nefertiti (Amarna period) and Old Masters’ paintings up to Bauhaus design. There is definitely something for any taste. On our cultural pages we will introduce you to a choice of the most interesting museums. To discover the city’s cultural wealth we recommend the three-day-ticket “Museumspass” valid for most houses. It costs 29 € PP and you also can buy it directly from our guides. The official programme of the day that take place between Brandenburg Gate and Reichstag. No wonder that in the city where Felix Mendelssohn and Herbert von Karajan lived and worked music plays an important role in cultural life. There are three opera houses and plenty of concert halls, orchestras led by famous directors like Daniel Barenboim, Sir Simon Rattle, Pierre Bouchez and Kent Nagano. For those who prefer modern music the offer is even wider. Every week there are countless concerts (of possible styles) in clubs (of all sizes). By the way, did you know the MP3 format and techno music were German inventions. One of Berlin’s traditional festivals since 1964, with concerts in 6 locations and film screenings at Babylon cinema. This year the main focus is on New Orleans Jazz. A festival of fairy tales, an opportunity for those who understand the language of Goethe. A varied programme of 17 days around lore and legends. 2017: "DIE LIEBE IST EINE HIMMELSMACHT"
You may think that wintertime is not precisely the best time of the year to be walking the streets of Berlin. Don’t be mistaken! In December, Berlin fills up with wonder and surprise. Preparing for Christmas, the city the ideal place for shopping if you are looking for original gifts. Not only at shops and warehouses, which now are allowed to open longer in the evenings, but also on the traditional Christmas markets inviting to stroll around for hours browsing the stands. There are many ways to avoid getting cold feet, but a glass of mulled wine or grog is definitely a tasty one. It’s been a few years now that Berlin has started to compete with other German cities famous for their typical markets of the pre-Christmas period. When December draws near the city dresses up nicely, inviting everybody to enjoy themselves in a friendly atmosphere and a traditional surrounding. At many stands you will find authentic hand-crafted products (not made in China). Or how about trying some of the regional specialties on offer?